This cover is used in Kraftwerk - Machine turned inside out. 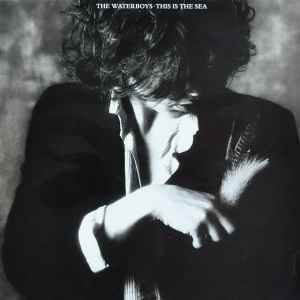 The Waterboys at their very peak! Each song deserving of release in it's own right, with no weak track on the entire album. Setting you in with a Spanish influenced fanfare straight into the thumping 'Don't bang the Drum,' the combined talents of Scott and Wallinger grab your attention into a wall of Thistlethwaite sax.Just when you thought it couldn't get better, you are moved through the anthemic delight of 'The Whole Of The Moon,' a soundscape of rhythm, brass, canon and harmony. A distant piano draws closer into the minimal but guiding 'Spirit'. The fitting finale to side 1 is 'The Pan Within's screaming melodic fiddles over that trade-mark thumping rhythm, Scott sings out "all we've got to do is surrender", if you've not moved already, you may need a doctor! Side 2 starts on a similar power-beat fashion the invite to move on up to 'Medicine Bow' before going onto the beautifully descriptive reflection of 'Old England', a hauntingly rhythmic melody, overlaid with lyrical brilliance and a crying sax to a slower feel. Lured into a false sense of security,you are then treated to the energetic 'Be My Enemy' which combines all of the above into a punk fueled frenzy which loses none of the earlier catchy melodic qualities and ends with a bump. 'Trumpets' gives you the perfect antidote to the energy expelled during the previous track, but still carrying the rhythmic keyboard that holds this well crafted album together. In another anthemic finale, we are encouraged to move forward and not hold ourselves back, everything that came before, well "that was the river and - 'This Is The Sea' ". Hard to follow this album, so just play it again!!! The sound of this remaster is a lot more compressed than the original 1985 release. By doing so it sounds a lot more powerful. Unfortunately all the beauty and dynamics have gone. Also a lot of fine finesses and little sound effects are now inaudible. For the original album this is a poor edition. A remaster is NOT always an improvement! The only great thing about this edition is the second disc. So much beauty, some better than the tracks which made it on the album.